The weather before Christmas was quiet and suitable for maintaining antennas. So I improved the matching of my 160m inverted L-antenna to get some more DXCC entities during the days off. Conditions on Top-Band were very good at a K-index of 1 and the signals, especially from Asia, were very loud in times. 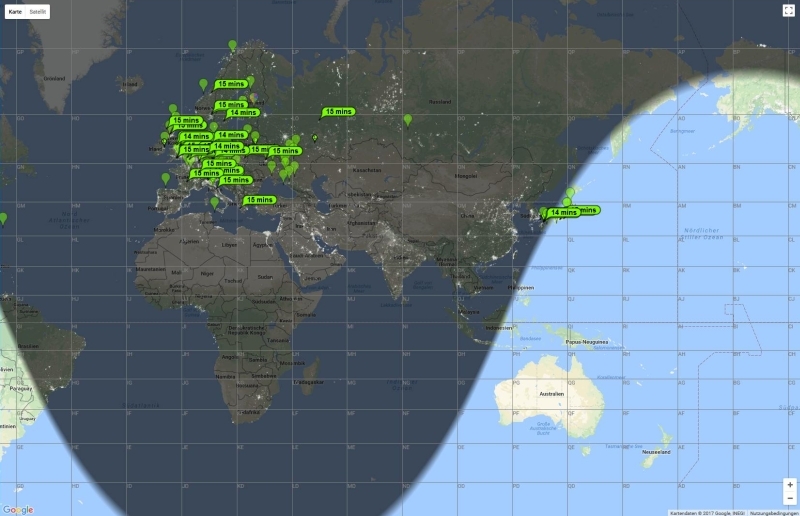 The following 6 new countries have been logged: Mozambique (C93PA), Azores (CU3EQ), Mongolia (JT1CO), South Korea (HL5IVL), Taiwan (BV1AP), Mexico (XE1TD). Also four new Zones for 160m WAZ (03 / 06 / 23 / 37) and seven new US-States for the 160m WAS were worked: Arkansas (K5GO), California (K6RW), Colorado (K0RF), Michigan (K8TLC), Minnesota (K0TT), Montana (KM7W) and Utah (WA7LNW). It was interesting to see how the terminus of the greyline correlated with the higher signal strengths (see picture). Talking about 2m I concentrated to EME during the days between Christmas and New Year. 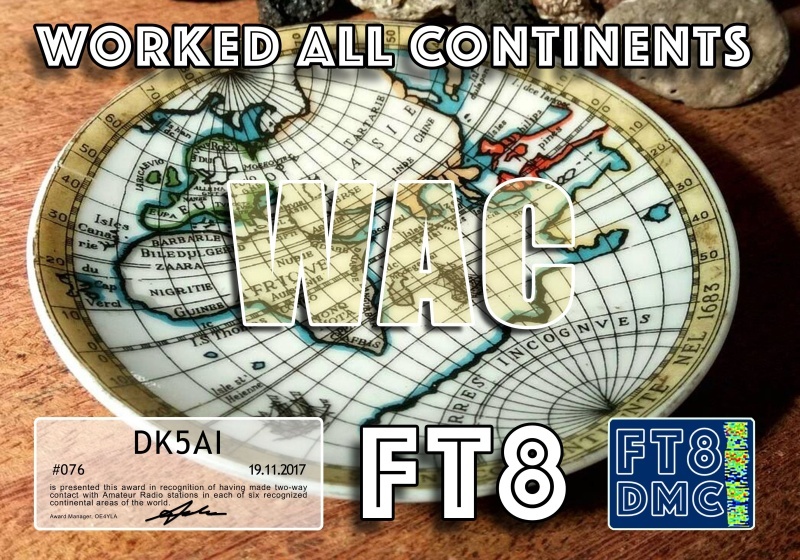 The moon was in good position with low degradation and finally 43 initial callsigns, several new WW-locator and two new DXCC entities found the way into the log. 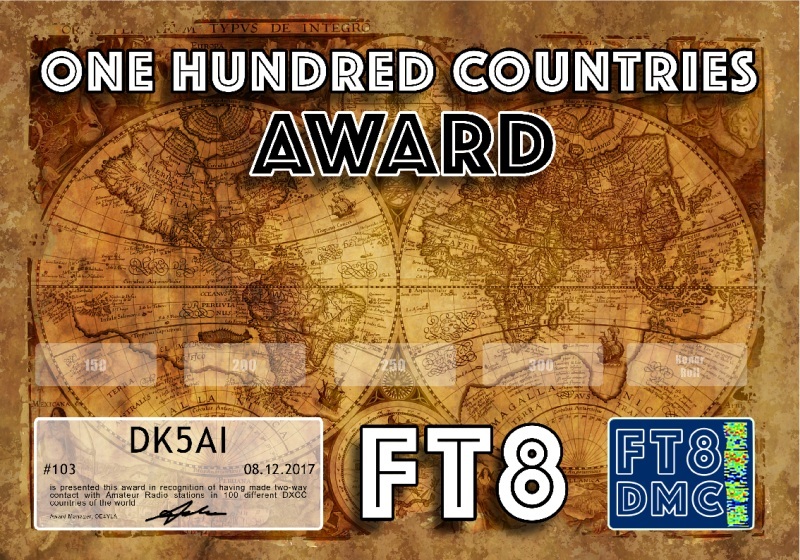 After several tries I was very happy to work Ricardo, LU7FA, on Dec. 27 for DXCC #67 and Bing, YC2MDU, on Dec. 31, 2017 for DXCC #68. It is interesting to mention that LU7FA has just 2 antennas and YC2MDU using just 400 W output. Two great belated Christmas gifts and a happy ending 2017.